The 2018 football season is finally here! If you didn’t know, ThingToBring was originally created to make our own tailgates easier and more organized. Everyone bringing beer was great, but we all watched the game hungry and maybe just a little wobbly. T2B solved our tailgating duplicates and we had a feast. We love tailgating! Last year we created a new feature making a whole season of tailgating super simple and you loved it. We added the 2018 home schedule for all NCAA and NFL teams in your T2B dashboard automatically populating a full season of tailgating events for your favorite teams. We’ve done the hard part, now get to it — select your team, invite your friends and create your whole season of home game tailgating signups in just a few minutes. The tailgating signup feature series is for premium users. Select your preference – $5/mo or $30/yr/. Then, simply select your team, add the things you’d like people to bring to each tailgate, or let your friends add their own things. ThingToBring will generate a link that you can send to your friends to view all of the home games. All they have to do is RSVP and sign up for things to bring to games they will be attending. Invite your usual suspects to the all of your home game tailgates at one time and monitor what everyone is bringing to each game throughout the season. Register and create an event at thingtobring.com. You have an event and you have things for people to bring. Awesome! Now bring on the fun with the talk, the questions, the banter leading up to the event. Particularly with tailgates and potlucks — there are no missed opportunities for a little razzing. Use the message board to ask for a specific cake flavor, suggest a favorite kind of beverage or trash talk about who’s going to make the best appetizer. Calm down friends, not everything has to be a competition, but the message board sure does help put the fun in planning an upcoming gathering. ThingToBring subscribers now have access to the message board feature for their upcoming events. If you’re not a subscriber, it’s super simple and worth every penny. You can sign up here for $5/mo or $30/year. Gather – it doesn’t matter where it matters with who and the memories you can create. Make it easy for the host and everyone else with ThingToBring.com. 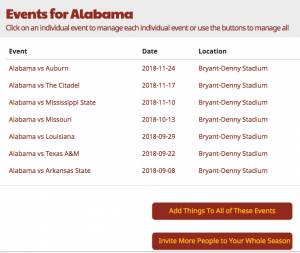 ThingToBring, the premier webservice and mobile app for tailgating management and potluck signups, released a new feature just in time for the 2017 football season. 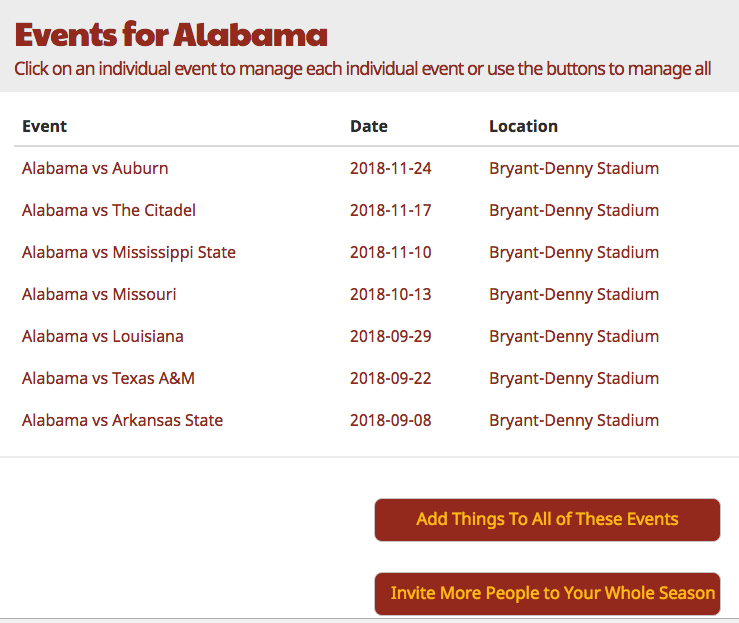 This release automatically populates your favorite college or NFL team’s full season of events for home game dates for even easier tailgating sign up and management. With the newly released feature in beta, ThingToBring is offering the service for free for a limited time to get feedback from users with intention to add the pre-populated seasons to their premium tier. Simply select your team, add the common things you’d like people to bring to each tailgate, or let your guests add their own things. ThingToBring will generate a link that you can send to your friends to view all of the home games, RSVP and sign up for things to bring to games they will be attending. Invite your usual suspects to the all of your home game tailgates at one time and monitor what everyone is bringing to each game throughout the season. 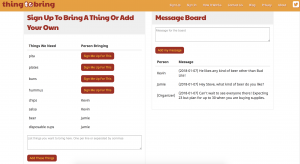 ThingToBring was created in 2012 to offer an easy way for event hosts to organize and manage who’s bringing what to the event. Register and create an event at thingtobring.com or find the app in the iOS or android app stores. Contact Robyn Spoto – robyn@thingtobring.com for media inquiries. The ability to manage a full season of tailgates comes in really handy when you have your regular group of compadres that gather every home game with a pre-planned menu. The ourtailgate.com site intended to elimate the headaches, calls, emails and group text messages that comes with tailgate event planning. ThingToBring.com was developed in 2012 for many of the same reasons – our founder didn’t want to get stuck bringing all the food to his tailgates and realized too much confusion among what everyone was bringing. Tailgating is way too much fun to be stressed about the menu and who’s bringing the drinks or plasticware. As an alternative to the ease you found with ourtailgate.com, ThingToBring can now manage full seasons by creating a custom page of multiple events. You can easily duplicate events so you can make quick edits and then send the full season to your regular tailgate attendees all at once. We’re sad to see such a great service like ourtailgate.com come to end. We’re hopeful optimists that maybe we can find a way to partner with the ourtailgate.com team to offer ThingToBring as the ourtailgate.com alternative. In the meanwhile search no more for a tailgate organizer, T2B has you covered. It’s a wrap 2016! It’s been a busy holiday season and now it’s time to relax, enjoy one last gathering with friends and family to celebrate the many blessings the year brought and anticipate the growth and excitement 2017 is sure to bring. Allow your New Year’s Eve gathering to be effortless with our recommended signup list for your guests. Champagne – Ring in the new year with a toast and cheers of your champagne of choice. Make sure there’s enough for a half a glass for everyone. Kids also love to participate with sparkling grape juice. And don’t be picky about the glasses. Plastic champagne glasses will work great and you’ll have enough for everyone. Easy appetizers – Having finger foods and appetizers to last through the evening avoids having to prepare a meal and keeps everyone moving and interacting. We love these ideas from food network. Shrimp cocktail, stuffed mushrooms, deviled eggs, mini sliders and more can easily be prepared ahead of time. Complement with a fruit tray, veggies, nuts and pretzels. 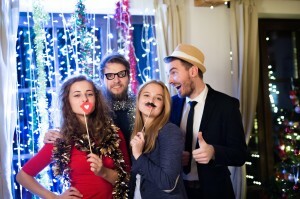 Photo booth props – It’s all about taking pictures and posting on social. You can buy a package of props on amazon to be shipped in time and your guests will have a blast. Add a couple of selfie sticks and any backdrop will do – your Christmas tree, outside lanai, a white sheet or any wall. Don’t complicate things – the props, the phones and your silly friends will be enough entertainment. A great playlist – There are pre-built playlists ready for you on spotify, pandora and any mobile player so don’t worry about creating one ahead of time. Spotify combines hits from the year from all genres. There are also apps that let your guests choose what plays next. It’s another fun way to keep everyone engaged. Here’s an app option but there are handful available. Host sharing is so 2017! Get with the trend. Gather and be merry! From the most elaborate to the simplest of tailgates, aside from the wonderful company, the food is what makes a winning tailgate party. 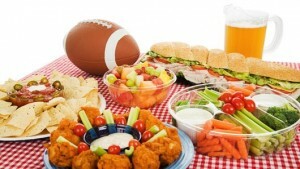 Here are some ideas to score a win at your next tailgate and how to get all of your tailgaters involved in the menu. Chili – A fall and winter favorite that can be made at home and transported with a portable gas burner to keep it warm. With so many great complements to this dish like cheese, sour cream, crackers and a cold salad on the side, it gives your tailgating guests a chance to get involved. Sliders – Chicken, beef or pork, sliders make an easy grilling or crockpot favorite with creative stackers to join the main protein in between the buns. Coleslaw, condiments, tomato slices, pickles, chips, side salads, beans are all asks to your friends for items to bring. Brats – There’s nothing better than brats at a tailgate. Don’t forget the onions, green peppers, sauerkraut and sides of your liking to add to your list for guests to bring. Ribs – A southern favorite on the grill with a homemade rub or barbecue sauce will have tailgaters’ mouths around you watering. Baked beans, macaroni salad, garlic bread, corn on the cob makes for a perfect meal without all of the burden on the tailgate host. Anything on a skewer – Really, just about anything. Veggies, chicken, shrimp, even some fruit. Stack your favorites on a stick or let your guest build their own before grilling. A kabob tailgate it is. Don’t take the food burden as the tailgate host. Get all of your tailgaters involved with an easy to use sign up sheet like Thing To Bring. In fact tailgating was the inspiration for building ThingToBring. Our founder, Steve, has always been the host and organizer for USF football games and his guests continually asked – what can I bring? He wrote the first version of the service for his own personal use so he could assign them a thing to bring. Plan the best tailgate party with top notch tailgate food by getting everyone involved in planning the menu and bringing the food. Gather and be merry. Go Team! Today was “meet and greet” for my kids before school starts Monday and I really enjoyed meeting their teachers. My boys walked up with a smile on their faces and shook hands with their new teacher, the one they’ll spend nearly everyday with for almost an entire year. I noticed every teacher had their own unique presentation of asking for additional supplies they need that go beyond the rather detailed supply list each student is instructed to purchase. One of my son’s teachers had a cute flower pot with each flower as a different need in the classroom – science kits, an electric pencil sharpener, gift cards to amazon, target and other items to help make their classroom even better. I deeply appreciate a creative, well organized teacher that can lead 20+ kids to a love of learning. It’s a hard job. They need stuff in the classroom to make learning fun, interesting and help tell stories. As a parent, I want to help provide it. They spend a lot of time with my kid and make a life long impression, so any contribution I’m able to extend, I do. Here are a three back to school lists to remember. 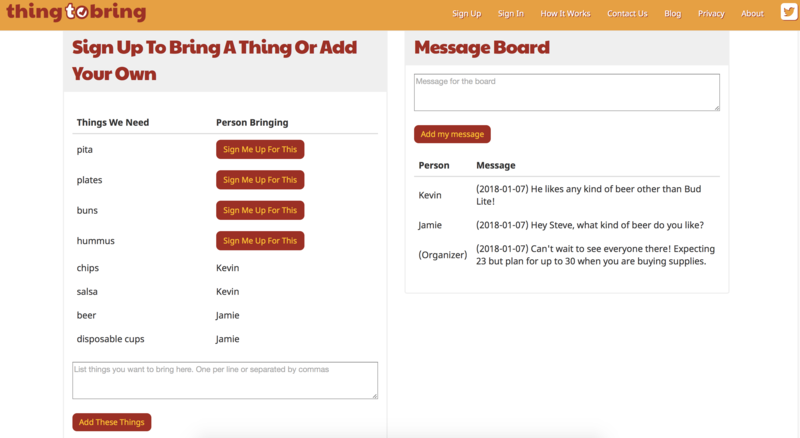 Teachers and homeroom parents are staying organized using ThingToBring to know who is contributing what to an ongoing supply list, party or fundraiser. 1. The Year Round List – Date the event for the last day of school and keep an ongoing list of items needed in the classroom – tissues, glue, sanitized wipes, etc. Everyone on the list will be notified when a new item is added and someone signs up for something. Parental camaraderie helps keep the classroom stocked all year long without the teacher having to personally ask for it. 2. Classroom Parties – Create a sign-up sheet for the Halloween, Holiday and Valentine’s parties. Add the arts and crafts, games and snacks you need. Your previously invited parents will be saved from your Year Round List so it’ll be fast and easy to create new lists. 3. Fundraisers & Donations – Our school does annual can drives, auctions, shoe drives and more. At times, classrooms put together baskets, or a collection of items that specifically represent the class. It’s nice that the list is open for all invited to see. This helps parents support each other and reach out if it appears one needs help gathering items or financially needs help with their own child’s supplies. The needs haven’t changed and the lists are long. 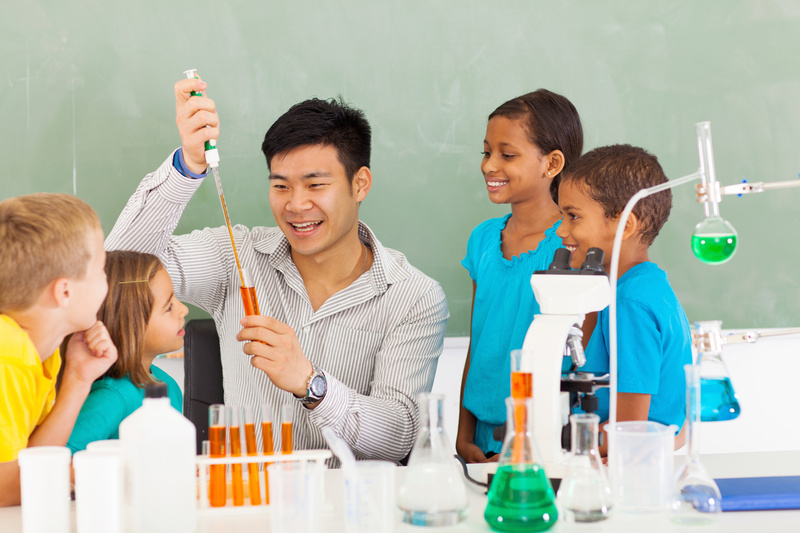 Teachers don’t have a supplied budget for classroom enhancement and back to school lists. They lean on parents for support. In fact, majority of teachers purchase student supplies with their own money as reported by The Journal from a recent study. According to the report, teachers expect to spend a total of about $500 on school supplies by the end of this school year, 47% of which will come from their own pockets. I’ve watched every teacher I know stretch an inch into a mile with creativity. They’re experts on conserving resources based on the experience of not having much. 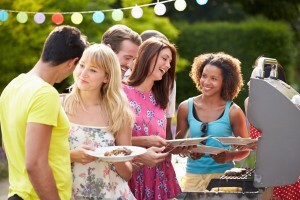 Is your backyard the perfect place for a summer cookout? Mine is – I have a beautiful, large oak tree that shades the entire yard with plenty of space for the kids to throw the ball around. The screened patio is great to hang out, grill out, watch a game on the patio TV or listen to my summer playlist. As you can see, I’m going to take advantage of the outdoors and have family and friends over for the best summer cookout. I’ve compiled a fantastic menu with recipe links and options for each course as well as games to make my backyard party even more memorable. Are you coming over? As the host, I tend to stress about getting everything ready and making the event perfect. It feels so much better answering the question from my friends, “what can I bring” with a signup list ready to go with ThingtoBring. I use the iOS app more than the site to keep track of who’s bringing what to this summer cookout. Cocktails. I always start here! I recently watched Tiffani Theissen mix up a Peach Texas Tea with Tequila and had to give it a try. All I can say is YUM. Delish also offers up other no-fail summer cocktails. Appetizers. I love a good, light caprese salad with fresh mozzarella and ripe tomatoes with a fresh, right from the farm olive oil, but any of these apps from Bon Appetit will do just fine by me. Meat on the Grill. I’m in Tampa, so I’ll be choosing a fresh caught grouper from our Gulf. 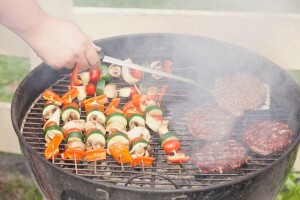 I love how Grilling Companion compiled the most popular grilling recipes based on the top 10 grilling cities around America. Choose your main course to fit your location for a fun, local touch. Sides & Salads. Everything is better with bacon and this BLT Pasta is a must for my summer cookout. Potato salad, corn on the cob and other cookout side staples are organized nicely to choose from thanks to the food network. Dessert. It’s hot. It’s summer. Dessert at my party will be cold, fruity, and sweet. Raspberry icebox cake is my choice. I love fruity desserts. These are a few runner-ups on my list. Maybe I’ll assign 2 or 3 desserts in my ThingToBring list. You can never have enough dessert, right? Add a couple of game options and you’re party planning will be done. Water balloon dodgeball and lawn jenga are a ton of fun but don’t forget about slip and slide wiffle ball and traditional horseshoes. Of course, you can find all the outdoor cookout games your heart desires on Pinterest. Create ways to share fun, quality time with your family and friends. There’s no need to stress when you’re the host when you use ThingToBring. 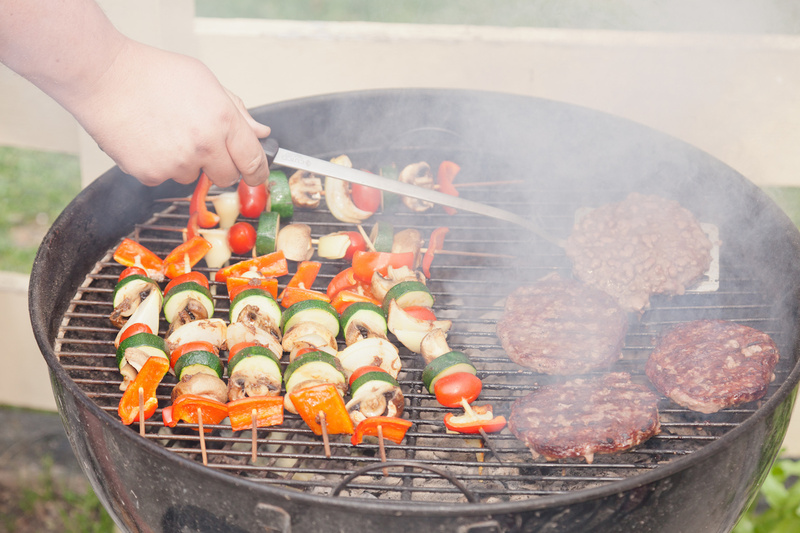 Let us know how your summer cookout goes. We love Super Bowl gatherings – cheering for our favorite team, watching the clever commercials, hanging out with good friends, but most of all, we love the food! Snacks, sides and main dishes will be devoured while all eyes are on the TV. Whether you host the party or go to one, you’ll likely have a dish or two to make. Get acknowledged as the winner of the SUPPER BOWL with the best potluck recipes. These are our favorite dishes for the big game. The Snackadium. This is so impressive. Bring your ‘A’ game with this chip/dip/sandwiches/treat replica of a stadium. It’s sure to put points on your side of the board from HomeandHeartDIY. Chili. Choose white chicken chili or a hearty beef, but a football game just isn’t the same without chili. These are highly rated favorites on Food.com. Chicken Wings. GrillingCompanion.com has the best grilled sriracha chicken wing recipe. Sriracha sauce is a magically hot and delicious hot sauce from Thailand. This recipe is perfectly balanced with a little honey, lime juice and butter for a deliciously spicy, but not painful wing sauce. Pork Sliders. There are so many great recipes, especially for the slow-cooker. Really. Throw on some coleslaw and you’ve got a win on your hands. A nice variety posted here on Pinterest. Brownies – Keep it classic. Fudgy and chewy. If that’s too boring for you these are the cutest desserts and snacks compiled by Buzzfeed. Our top 5 choices can help you score big with your friends. Gathering is fun and easy when everyone shares in the planning. Get bonus points for being tech savvy and use the ThingToBring site or app to make this Super Bowl not just about football, but a SUPPER BOWL with the best potluck recipes. Your December weekends are filled with gatherings among friends, family and co-workers. Don’t get caught up in the moment and prevent yourself from having a lingering office Christmas party mishap. Follow our top 5 tips so you aren’t “that guy.” Your reputation will thank us. Sure, have a glass or two, but when you drink too much in mixed company, you’re bound for a fail. Before you know it, you’re the self-proclaimed comedian telling inappropriate jokes in front of your wife’s boss creating quite the lasting impression. Secret Santa Gift Gone Wrong. If you’re doing a gift exchange, stay conservative. Get a candle, snowglobe, spirits, a scarf – here are some suggestions from Bustle. Just stay away from the gag gifts because you think you’re funny – fake poop, underwear and definitely stay away from the adult entertainment store. You’ll have a rep damaging photo on social for eternity guaranteed. Don’t go to your office Christmas party empty handed – ask what to bring in advance. Don’t get complicated with your dish. Stick to easy meals and crowd favorites. Suggest to the host a potluck sign up app or service like Thing to Bring so everyone can complement each other’s dishes. Not bringing anything = loser. So your co-worker and girlfriend are wearing similar dresses . . . look before you smack. Accidentally smacking your co-worker on the backside thinking it’s your girlfriend will almost always end the party with an unhappy spouse and call from HR. Never be the last one to leave. If your hosts are yawning and washing dishing, the night is over. Pick up on the cues and time it so you’re not the first one to run out but definitely not the last. Get an invite next year by following our top 5 tips to prevent an embarrassing office Christmas party mishap. Enjoy as much time as you can with family and friends and have a safe and happy holiday!